Panera has joined the ranks of big-name food chains pledging a switch to cage-free eggs, reported TIME. The company aims to have 100 percent of its eggs cage-free by the year 2020. Currently, Panera locations' eggs are 21 percent cage-free, showing a 3 percent increase since 2014. The initiative will apply to all Panera's pastries, souffles and dressings. The cage-free products will include hard-boiled eggs, shell eggs and liquid egg whites. The company owns around 2,000 Panera Bread locations across the country and this cage-free push will apply to them all, explained TIME. Panera isn't the first popular restaurant chain to take the plunge. The company joins powerhouses like McDonalds, Starbucks and Chipotle in their move towards sustainably sourced eggs. These businesses are focusing on their supply chains to create a more ethical sourcing process, explained The Washington Post. However, the move to cage-free eggs takes some time. McDonalds, who is the biggest buyer of eggs in the U.S., has mapped out a ten year plan to make sure 100 percent of its locations are using cage-free eggs. The famous fast food chain uses over 2 billion eggs in its U.S. locations alone every year. This adds up to 5 percent of the total egg production in America, reported The Post. Understandably, reconfiguring supply chain practices to accommodate this amount of eggs will take time. 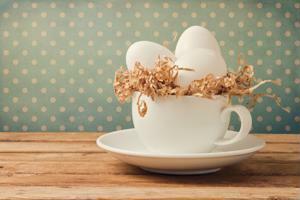 For Starbucks and Panera, the amount of eggs used in their store locations is a little lower. These companies have set out to be 100 percent cage-free in the next five years, noted The Post. Eater provides a comprehensive list of food companies that have joined the cage-free egg movement. Chipotle stands strong as a company that has already managed to make a 100 percent switch. Familiar favorites such as IHOP, Burger King, Dunkin Donuts and The Cheesecake Factory have made some level of commitment to becoming cage-free. However, the pressure does not fall solely on these big-name companies, explained the source. As of now, egg-laying hens in the U.S. that are considered cage-free are at a low 10 percent. Farmers within these supply chains will need to figure out how to get their farms on board or risk losing major business, reported Eater. While many big-name fast food chains have taken the initiative to improve sourcing standards, one major brand has remained notably silent. According to The Washington Post, Yum! Brands has repeatedly shied away from the spotlight when it comes to sourcing practices. The parent company owns key chains such as Taco Bell, Pizza Hut and KFC. In a time when companies are speaking up, the silence maintained by Yum! Brand restaurants has made a notable mark, explained the source. In a recent report by a variety of organizations KFC, Taco Bell and Pizza Hut were given Fs when it came to sourcing. The worst part? There have been no pledges to reevaluate supply chain practices, noted The Post. The failure to participate is sustainable sourcing practices was largely credited to cost issues and supply chain management. The Post quoted Executive President of Technomic Darren Tristano who ultimately believes that Yum! Brands' "supply chains haven't been able to keep up." With a chain like Taco Bell, low pricing points are its main marketing appeal. Switching over to ethical sourcing practices, like cage-free eggs, would cause pricing bumps that the company's target audience would not like, noted The Post. Companies like Chipotle and Panera have founded their businesses on higher prices for better sourcing. Generally, their client base is willing to bite the bullet on price spikes in the name of better supply chain practices. Yum! Brand chains don't have that going for them. "Taco Bell is at such a low price point, even for fast food, that their value proposition makes it really hard to switch to any sourcing that will affect price," explained Tristano to The Post. The parent company has made some efforts when it comes to its sourcing. In April of this year, Yum! Brands committed to better sourcing palm oil with particular attention to deforestation, reported Sustainable Brands. The goal set out by the company aimed to have 100 percent sustainably sourced palm oil by the end of 2017. While the effort was noble, many NGOs complained that the plan left out critical products such as baked goods and sauces, explained Sustainable Brands. "Fast-forward to January 2018, when the commitment goes into effect, if I'm eating a KFC meal including the Colonel's Original Recipe fried chicken with a biscuit and gravy, Yum! Brands' failure to expand their commitment to all palm oil uses means my finger lickin' good chicken isn't linked to deforestation, but my biscuit and gravy does not come with the same assurances," said an Analyst with UCS's Tropical Forest and Climate Initiative Lael Goodman, according to the source. Yum! Brands is falling short of supply chain standards at a time where its key competitors are making major strides. Undoubtedly, consumers and industry leaders will have an eye on the company for future supply chain commitments.